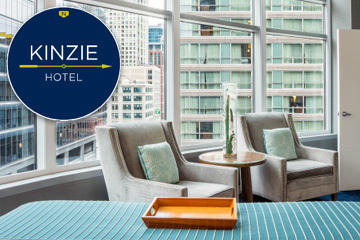 Discount parking for the Kinzie Hotel is available at the Marina City Chicago parking garage located at 300 N State Street. The parking garage is enclosed and minutes from the Magnificent Mile, Chicago Riverwalk, Millennium Park, and Grant Park. Self-park ($39) and valet service ($64) are offered. Reserve now to save on parking. Enter parking entry and exit dates and times. Click "See All Options" below the "Buy" button. A pop-up will be presented. Click "Have an access code?" under the dates and times in the "Pre-Purchase Parking" section. Enter access code Kinzie and click "Apply" button. Select either the Self Parking or Valet Parking discounted option and proceed to checkout. The self-park does not allow for in and out privileges. The customer has to checkout and exit the self-park by 3 PM the next day or they will be charged for another day. The customer has to checkout and exit the valet by 7 PM the following day or they will be charged for another day.